I read that answers at this question: Preparing design for duotone printing? I need it to be more specific about the step: use the complementary RGB channel, in this case Red (E) Play with the contrast. Where can I find the compl. RGB channel while working in grayscale? Also, in which way do I combine these two layers? The result is fantastic and I wish to make it myself! I guess the answer is talking about the complementary color of the image main color: cyan, which is red, the opposite. This gif follows the step by step of the answer included in the question. It is not the right method for a two-ink printing, it's only the creation of a RGB image in duotone such as the explanation. 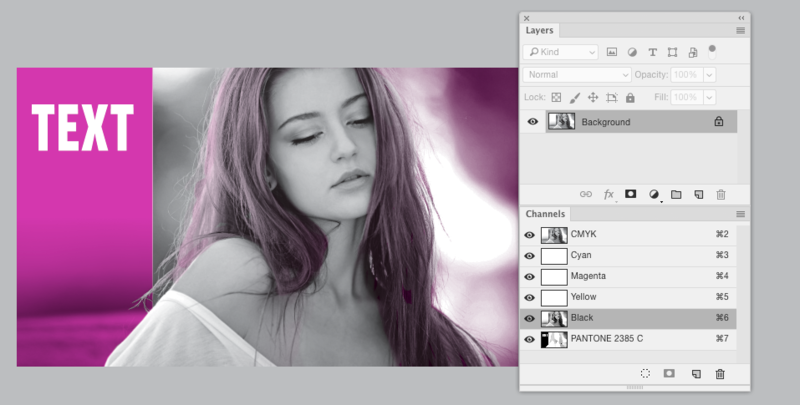 This other answer shows more details about how to make a Photoshop Duotone. I'm not one to use RGB color more for Offset printing, and especially for duotones. If you work on RGB to create the perfect duotone, well.. that image will need to be converted to CMYK for printing. When it's converted, your (visual) 2 colors gets split across the CMYK channels and it's no longer a duotone technically. It may still look like 2 colors, but it's a 4 color image, not 2 color. This creates a real duotone. Save as DCS 2.0 (or PSD) and place in a layout application. Convert the image to CMYK - Image > Mode >CMYK . Look at the Channels Panel and highlight the channel with the most contrast (often the Y channel). Select all and Edit > Copy. Then highlight the K channel and Edit > Paste. Now fill the C, M, and Y channels with 100% white, so they are "empty". Save as DCS2.0 (or PSD) for placement in a Layout Application. Not the answer you're looking for? Browse other questions tagged adobe-photoshop print-design rgb channel duotone or ask your own question. Choosing Pantone colours in Duotone dialog window in Photoshop?